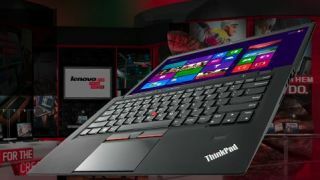 Lenovo is kicking off the new year in style with a Windows 8-powered, touch-optimized refresh of its business-class ThinkPad X1 Carbon notebook. Announced Tuesday, Lenovo is now accepting U.S. preorders for an updated version of its popular 14-inch business notebook, optimized for Windows 8 and available with Intel Core i5 or Intel Core i7 processors. Developed from superior grade carbon fiber for the highest levels of performance and durability, the new ThinkPad X1 Carbon Touch Ultrabook weighs only three pounds and is a mere 20.8mm thin. All models of ThinkPad X1 Carbon Touch feature 128GB of solid-state storage along with Bluetooth 4.0, a 720pHD camera and 1600 x 900 LED-backlit multitouch display. Built for mobile professionals who demand the best in mobility and entertainment, the Lenovo ThinkPad X1 Carbon Touch allows 10-finger touch on its 14-inch HD+ display, while also including a large multitouch glass touchpad. Both input methods have been optimized to work great with Windows 8; the base model runs standard Windows 8, while the Intel Core i7 model bundles Windows 8 Pro and doubles RAM to 8GB. The Lenovo ThinkPad X1 Carbon Touch Ultrabook is available now for preorder in two customizable configurations starting at $1,499 (UK£1,525) for the Intel Core i5 model. Orders from Lenovo's U.S. online store are expected to ship Dec. 21, with general availability through the company's international business partners in January at a $100 discount.